Problem-solving and skill-building extends well beyond the 'school house' for many Seattle Country Day School (SCDS) students. In particular, those who participated in Destination Imagination (DI) activities this year have honed their ability to work in teams to solve open-ended service learning and STEAM (science, technology, engineering, arts, and mathematics) Challenges. Solutions to Challenges are presented at both regional and state tournaments and those who advance are invited to compete at Global Finals, which is described by Destination Imagination Inc., as the "world's largest celebration of student creativity." 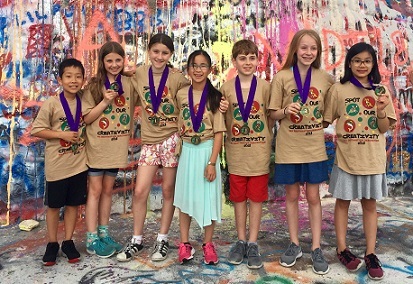 On May 23-26, 2018, The Radioactive Lightbulbs, comprised of six SCDS 5th graders—AJ Hwangbo, Zoe Weingeist, Alaire Dandel, Finn Swanson, Mian Oliver and Esme Lichong—along with SCDS alumna Kimberly Yeung '21, advanced to Globals. They were among 8,000 students from 19 countries including Australia, China, Indonesia, and Qatar that gathered in Knoxville, TN to compete and showcase their innovative Challenge solutions. The Radioactive Lightbulbs lit up the stage, placing first in the Instant Challenge and fourth in the Team Challenge for the Elementary Level Scientific categories. Look What's on the Ceiling, comprised of SCDS 7th graders—Nina Kibria, Alex Lipson, Olivia Rosoff, Ava Barnhartand—and SCDS alumnus Elliott Chalcraft '19, also had a strong showing, placing 13th in a competitive Middle Level Team Scientific Category. Both SCDS 5th and 7th graders' Challenges represented the culmination of a year-long effort of creative problem-solving, competing, and team-building in one of six categories: Engineering, Scientific, Fine Arts, Technical, Improvisational, and Service Learning. According to Interim CEO for DI Michele Tuck-Ponder, "When you get more than 8,000 of the brightest young minds in the world putting their talents on display, it really is awe-inspiring. Every year, we get to see the future leaders in STEAM, and I'm always amazed with what they produce."